A new multimillion-dollar brain research facility at the UBC Djavad Mowafaghian Centre for Brain Health (DMCBH) is now a reality. 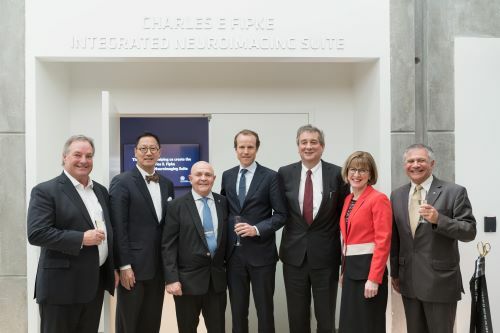 The ribbon was cut on April 8, 2019 on the Charles E. Fipke Integrated Neuroimaging Suite, a first-of-its-kind facility that will drive critical advancements in neurodegenerative diseases that include Parkinson’s and Alzheimer’s. “I would like to thank all of the donors who helped make this extraordinary facility a reality, giving our researchers the very best tools to bring better treatment options to patients,” said UBC President and Vice-Chancellor Santa J. Ono. “I am especially grateful to alumnus Charles Fipke whose commitment to tackle brain diseases like Alzheimer’s inspires us in this important research”.